Pocopson Elementary Second grader, Kaitlyn Wahl, carefully works on drawing a butterfly to be added to one of the quilts sent to A.I. duPont Hospital for Children and the Children’s Hospital of Philadelphia. POCOPSON – On Monday, many students in the Unionville Chadds-Ford School district turned their day off from studying into a day “on” for service. It’s all part of the district’s sixth annual Martin Luther King, Jr. Day of Service. Pocopson Elementary School was just one of many schools in the district which opened its doors to students and parents for service opportunities as a way of giving back to the community. 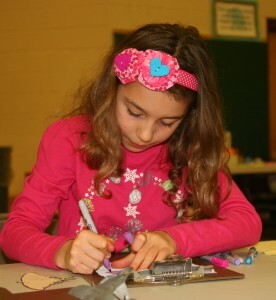 Stations were set up throughout the school’s gymnasium for designing patchwork squares for quilts, creating bookmarks, and tying fleece blankets. Approximately 100 fleece blankets were made along with over a dozen patchwork quilts carefully sewn. The blankets will provide warmth and comfort for sick children at the Alfred I. duPont Hospital for Children and the Children’s Hospital of Philadelphia. In addition, piles of children’s books, donated from Pocopson’s annual Book Swap earlier this year, will be sent to the hospitals too along with one-of-a-kind bookmarks designed by students themselves. “I thought it would be fun to come here because I enjoy making things to help other people,” says Stanislawczyk. “My mom helped out too by cutting fabric for the blankets,” she adds. Patton Middle School seventh grader, Shuhan Yin, works on tying her fourth fleece blanket as part of Pocopson’s MLK Day of Service. The MLK day of service is a natural fit for Pocopson Elementary. Pocopson Elementary wasn’t the only elementary school in the district focused on service. Hillendale Elementary School served as a soup kitchen with volunteers preparing quarts of soup as well as bagged lunches for delivery to local shelters and food banks. All schools in the district also participated in a district-wide food drive with donations going directly to the Kennett Food Cupboard. On this day of service, there appeared to be something for everyone.